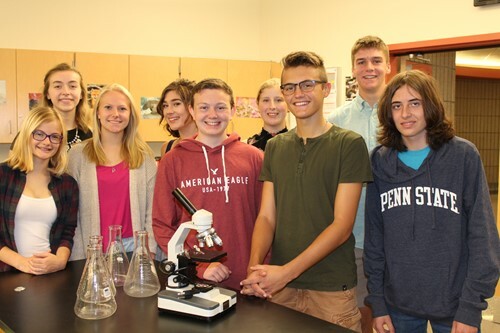 Nine Bethel Park High School juniors were selected to participate in the 2018-2019 Westinghouse Science Honors Institute. Participating in this year’s program will be Jonah Belback, Sydney Burns, Hannah Crawford, Saje Devine, Hannah Gold, John Gummo, Anthony Will, Lily Wilson and Lilly Zeminski. These students will attend a 12-lecture series, held on Saturday mornings at Franklin Regional Middle School to gain insight into careers in engineering and science. The lectures will be presented by local professionals and students are encouraged to interact with the presenters and ask questions to gain greater knowledge of the subjects being presented. Some of the lecture topics include nuclear power production, FBI forensic investigations, lasers and mechatronics, stem cells, bioengineering and anatomic ACL reconstruction. Students will also have the opportunity to tour the Breazeale Nuclear Reactor at Penn State. Students who are interested in participating in this program must go through an application process that includes recommendations from science teachers, high academic standing in science and the humanities, and a demonstrated interest in science. At the end of the lecture series, students will have an opportunity to compete for awards based on their scores on an end-of-the-course exam.